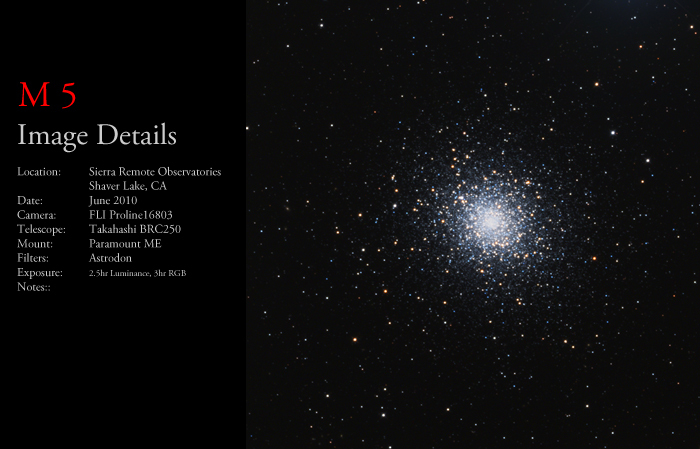 Messier 13 (M13, NGC 6205), also called the ‘Great globular cluster in Hercules’, is one of the most prominent and best known globulars of the Northern celestial hemisphere. At a distance of 25,100 light years, its angular diameter of 20′ corresponds to a linear 145 light years – visually, it is perhaps 13′ large. It contains several 100,000 stars. Towards its center, stars are about 500 times more concentrated than in the solar neighborhood. 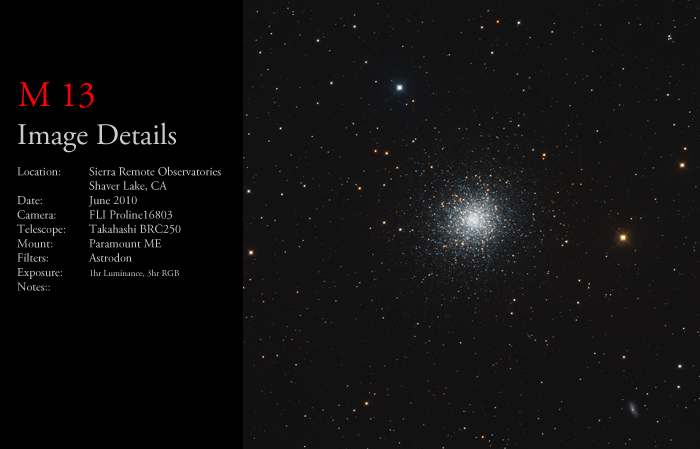 Spanning 165 light-years in diameter, M5 is one of the larger globular clusters known. The gravitational sphere of influence of M5, (i.e. the volume of space in which stars are gravitationally bound to it rather than being torn away by the Milky Way’s gravitational pull) has a radius of some 200 light-years. At 13 billion years old it, M5 is also one of the older globulars associated with the Milky Way Galaxy. Its distance is about 24,500 light-years from Earth and the cluster contains more than 100,000 stars, as many as 500,000 according to some estimates.